According to a report from MarketLine International, the switch from traditional wound dressings to modern moist dressings has helped the European wound-management industry grow at a compound annual rate of 8% over the period 1993-1997. What's more, the market in Europe is predicted to maintain strong growth at a compound annual growth rate of 8.9% from 1997 to 2002. MarketLine predicts that the value of the market will increase from its current level of $269.7 million to $412.1 million in 2002. Moist wound dressings are more cost-effective because not only is the frequency of dressing changes reduced, but wounds heal more quickly in a moist environment. With users recognizing the cost benefits of these dressings, MarketLine expects the rapid growth of the market to continue into the next millennium, despite strong downward pressure on prices as a result of hospital budget constraints. This is not good news for manufacturers of low-priced traditional dressings, whose products are looking increasingly obsolete. Despite good prospects for moist dressings, the potential for new entrants to succeed in the market is unclear. MarketLine analyst Thomas Chan comments, "With such attractive growth in the modern dressings market, it should, in theory, be possible for new entrants to be accommodated. However, the reality is more complex, with different systems, such as reimbursement lists, operating in different countries. It remains to be seen how much of the approval process will be harmonized with the implementation of CE marking this year." The present high profits for moist dressings are set to come under increasing pressure in the future as competition increases and buyers command more power through the formation of buying groups and tendering. Although certain market segments such as films are quite mature, there remains great potential for growth in newer sectors, such as the hydrocolloids market and the less developed segments of alginates, foams, and gels. The European hydrocolloids market has largely been driving the growth of moist dressings, as they have the greatest user awareness among the range of such dressings available. The market has increased almost 40% since 1993, from $126.2 million to $176.2 million. Despite the falling prices for dressings caused by increasing competition and buyer power, volume growth has been strong and will continue to drive the market in the future. The foam dressings market is relatively young and represents just a small percentage of the overall market. Uptake of foam products is increasing, although it has been hindered in the past by a lack of product awareness. According to MarketLine's forecasts, there is great growth potential for this sector, especially as some users are presently unable to distinguish between hydrocolloids and the lesser-known products. 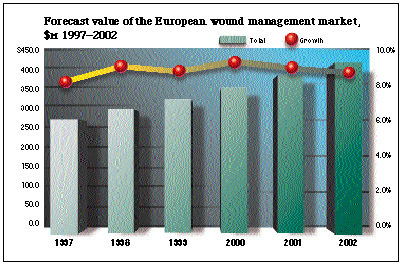 The fastest growing segment of the wound management market over the last five years has been in alginate dressings. It has been driven by an increasing awareness of their use as an alternative to hydrocolloids for treating specific indications. The European market is forecast to grow with a compound annual growth rate of 18.2%, reaching $49 million in 2002. For more information on this report, contact MarketLine International at +44 171 6242200, e-mail [email protected]. Zotefoams plc, a UK-based manufacturer of cross-linked foams, has announced that it is bringing its foam manufacturing technology to the United States. The company plans to invest $25 million in a new facility that is expected to be operational in 2000. Randall Redd, president of Zotefoams Inc. (Hackettstown, NJ), the company's U.S. subsidiary, says, "When complete, the facility will produce our complete range of products, including Plastazote cross-linked polyethylene foams, Evazote cross-linked VA copolymer foams, Supazote cross-linked super-soft copolymer foams, and our new Propozote polypropylene foams." The company's unique manufacturing process expands the foam by using pure nitrogen, resulting in high product quality and consistency. The process also allows production of foams with a very wide range of properties, from very soft and smooth Supazote materials to tough but moldable high-density Plastazote products. For more information, contact Zotefoams Inc. at 800/362-8358. Thomson Industries Inc. has acquired Airpax Mechatronics Group, a division of Philips Electronics North America Corp. As part of the Thomson Industries Group, the acquisition has been renamed Thomson Airpax Mechatronics LLC. The Airpax Mechatronics Group designs and manufactures subfractional-horsepower motors, digital linear actuators, gearmotors, and motor electronics, and has operations in North America, the Far East, and the United Kingdom. John Thomson, Jr., chairman of Thomson Industries, says, "Thomson Airpax Mechatronics represents a strategic diversification in technology that complements our position in linear motion and our emerging strength in control technology. This will take us into new fields of motion control and motor technology." For more information, contact Thomson Industries at 516/883-8000. The finalists of the 1998 Medical Design Excellence Awards will be on display at the Medical Design & Manufacturing East Conference and Exposition, June 2-4, 1998, at the Jacob K. Javits Convention Center in New York City. Show attendees will have the opportunity to view the finalist products and receive information about how to submit an entry for the 1999 competition. The award winners will be announced during a gala dinner ceremony at the Plaza Hotel on the evening of June 3, and will be subsequently published in the July/August issue of Medical Product Manufacturing News. The awards program, which recognizes excellence in medical design and engineering, drew more than 230 medical device, component, and material entries. The awards program is sponsored by MPMN's publisher, Canon Communications llc, and endorsed and administered by the Industrial Designers Society of America. For more information, contact Canon Communications at 310/392-5509, e-mail [email protected].